So throw off the bow lines, sail away from the safe harbour, catch the trade winds in your sails. Explore, dream, discover. Sail away with me, to another land… The beautiful Whitsundays are known for their 74 islands that dot the Coral Sea like emeralds in a silver necklace…where better to set sail with your true love on your lifetime adventure? The Whitsundays has an abundance of vessels to carry you away into a watery wonderland where you can marry on board, with the gentle splash of water on the bow and lazy creaking of the boat, or on a deserted beach with just you, your loved ones and the soft swaying of the she-oaks. 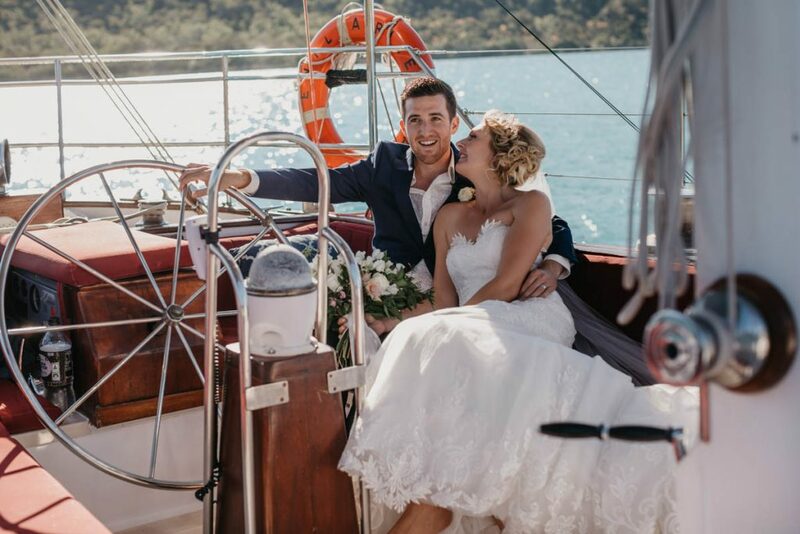 There is a boat to suit all weddings in the Whitsundays – from rustic and characterful to super-sleek and streamlined. 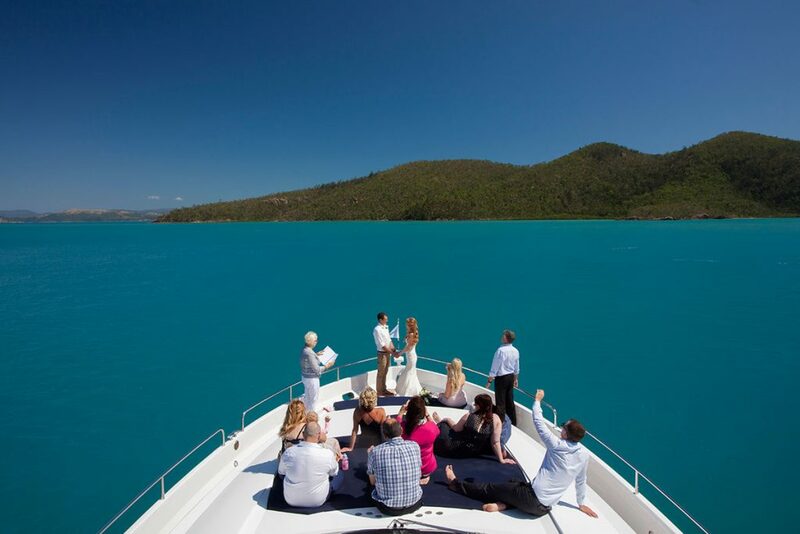 Following is the Weddings Whitsundays guide to nautical nuptials on the Coral Sea. 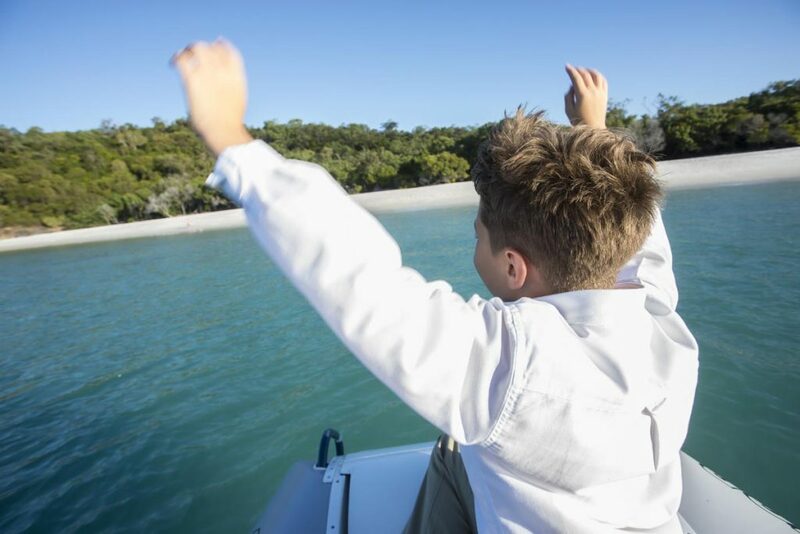 Choose a boat-happy celebrant and photographer! Choosing your celebrant and photographer is always a big decision but when marrying at sea it is important to choose ones that are comfortable around boats and are happy to join you on your adventure. 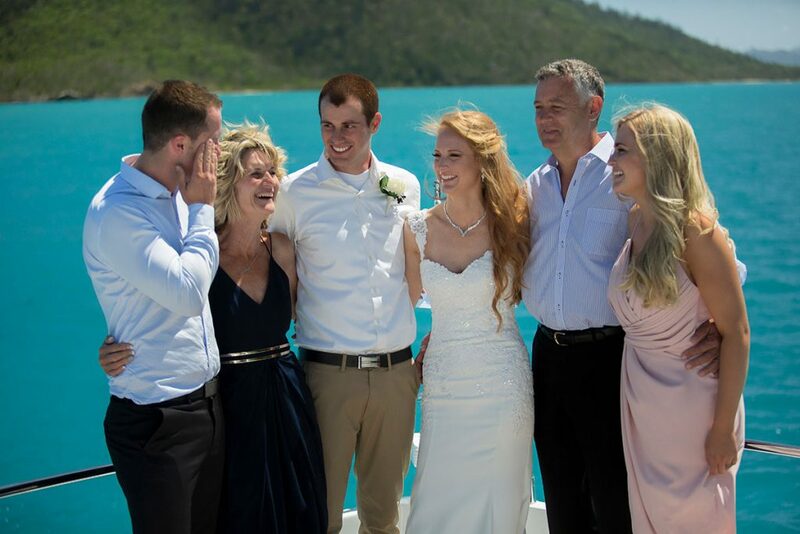 There are many sailing-savvy celebrants in the Whitsundays because it is such a central pastime, so make sure you ask the question when you do your research, and the same with photographers. Once your celebrant is ‘on board’, he or she will be a wealth of knowledge with regards to your options for different vessels, and can point you in the right direction. The kind of vessel you marry on is obviously key to the wedding day and there are literally dozens of choices to suit your vision for the Big Day. If you want a whimsical, romantic feel, you might want to consider an old timber Tall Ship, while a sleek, modern powerboat might be more your style if you are going for a more minimalist wedding. Numbers: Passenger numbers are strict, as vessels are surveyed for a maximum number of people they are legally allowed to carry. Numbers are therefore the first place to start when tying the knot on a boat (pun intended). Talk to the boat owner and they can advise their maximum capacity (less is obviously OK). Location can also affect numbers – if you plan to stay in Pioneer Bay just off Airlie Beach then most boats can accommodate more people. If you plan to head across the Whitsunday Passage out to the islands, boats are usually surveyed for less people. Crew: Check the number of crew your boat provides to ensure there will be sufficient service for the number of guests. Timings: Depending on the kind of boat you hire, there will be specific timings related to where you want to go, so it is very important to discuss this with either your coordinator or the boat company. A sailing boat, for example, is going to need a full day to go to Langford Reef or Whitehaven Beach, while options such as Ocean Rafting (a high-speed inflatable boat) take less time but are only suitable for a certain style of wedding. Staying on board for your ceremony is a cost-effective option, though do check minimum charter times with your vessel. See our quick guide at the end of this article for some of the many boat options on offer. This is obviously important with all weddings – the guests are your nearest and dearest after all – but boats are a special kind of venue that require a little pre-thinking up front. While a brisk sail might suit the younger wedding party members, it probably won’t suit your poor old gran who suffers from vertigo and would prefer a more stable option. Also, consider any family members or friends with mobility issues and ask for ramps if required. And make sure you provide adequate shade – consider a later or earlier wedding and avoid the middle of the day – and provide cold water for guests before and after the ceremony. Most boats are child-friendly and will accept littlies on board but they still need to be well looked after. Consider contacting Airlie Beach Babysitting by Danielle and bring a babysitter on the boat trip too so you and your guests can relax. Kids get bored easily and nannies will keep them entertained with games and activities. Just like weddings on dry land, weddings on board boats should follow an overall theme (and your theme will also affect your choice of vessel). Are you going for the “wind-in-your-hair and no shoes” feel, or the super-chic and sophisticated look with white roses and crisp linen table cloths and napkins? Either way, styling will have to be boat-friendly, so no flames, no top-heavy or tall centrepieces that could fall over, no flowing chiffon on the outside areas of the boat, which could become entangled. 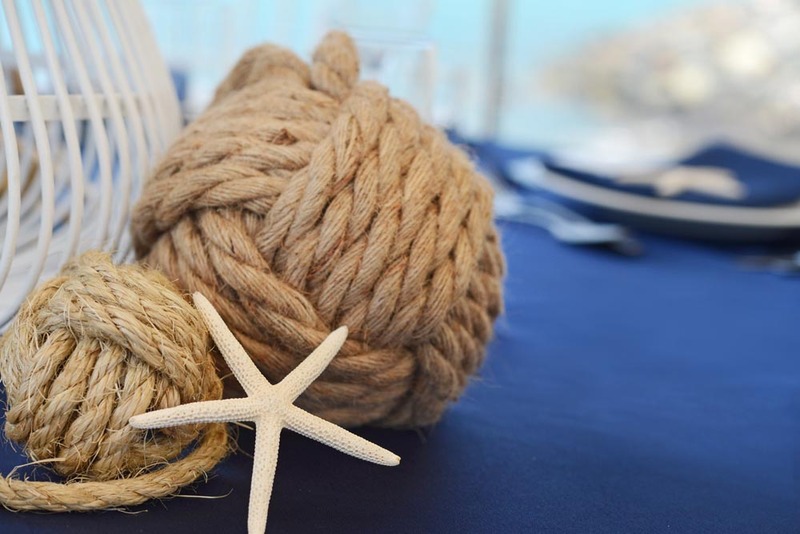 Talk to one of the excellent local wedding decorators and stylists available in the Whitsundays to bring your day to life and create your floating fantasy, while making the most of the stunning backdrop of the Whitsunday Islands and Coral Sea. Food is an element you will need to think carefully about and you have the option to cater your wedding on board, or at a venue on the mainland or one of the islands, following the ceremony. Some luxury boats offer ‘formal’ seating for small groups with tables and chairs but generally canapé and buffet-style work best and it will generally be a more relaxed setting. Most boats offer their own catering options (some have their own on-board chef) but will also allow catering to be brought in. There are several catering companies in the Whitsundays well practised at catering for functions afloat, so check with your wedding coordinator or celebrant. Keep it simple – fresh local-caught seafood is in abundance in the Whitsundays and cold seafood platters are popular for weddings on the water, perhaps with some lush tropical fruits as well. 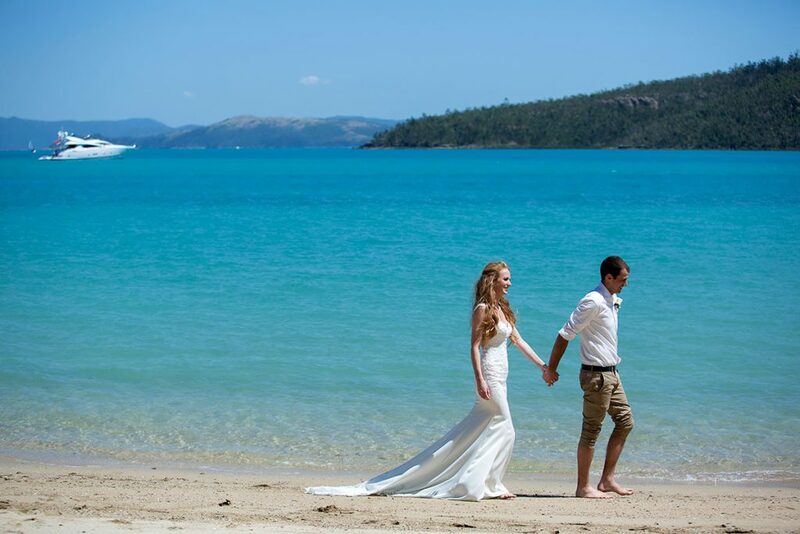 Wedding coordinators and planners in the Whitsundays have done this many times before and can save you valuable time by coming up with ideas, suggestions and solutions for your dream wedding on water. They will be able to assist from the outset, letting you know which boats are most suitable for the number of guests you plan to invite. They can also organise bridal transport if you plan to arrive separately by, for example, helicopter, and ensure the boat and helicopter are in contact on the day, and assist with inclement weather alternatives (not just rain but also wind). Having someone on hand who knows the wedding process and how to plan ahead, look out for pitfalls and handle any hiccups on the day, will give you peace of mind and the freedom to relax and enjoy your special day on board your dream vessel.